Template:Leapster US 2007 ? ? Sonic X is an early childhood educational cartridge for the Leapster Learning Game System‎ system. The objective of the game is for Sonic and Chris Thorndyke to rescue their friends Tails, Knuckles, and Amy and defeat Doctor Eggman by solving mathematical equations. Character sprites are taken directly from Sonic the Hedgehog 3. The game takes place across three different zones: Station Square, Angel Island, and Eggman's Base. There are also 3 mini games. 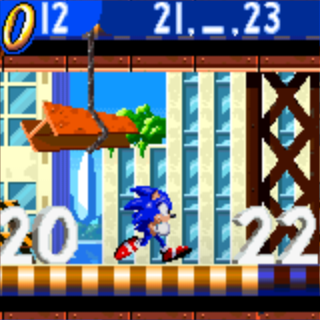 The game plays like a traditional Sonic game and allows players to run around levels and leap platforms. Rings are scattered around the levels which can be collected. Problem solving is also incorporated as there are question marks throughout the level that can only be passed after solving a mathematical equations such as counting, matching numbers, addition and subtraction. There are also occasions where Eggman's Badniks will pick Sonic up and ask questions about rings, and the pen must be used to answer the questions. This page was last edited on 8 April 2018, at 07:51.